Italy's parliament has ratified the EU Lisbon Treaty, which was rejected by Irish voters in June. Italy has become the 23rd out of 27 EU member states to approve the reform treaty, which is aimed at improving decision-making in the enlarged EU. The treaty has to be ratified by all 27 in order to take effect - and the Irish No vote has left its future uncertain. 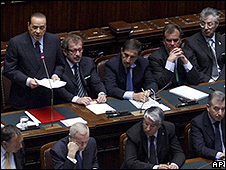 Italy's lower house approved the treaty unanimously on Thursday. The Senate (upper house) approved it on 23 July. The Irish Republic was the only EU member state to hold a referendum on the treaty. The other countries that have not yet ratified it are the Czech Republic, Poland and Sweden. The Irish government says it is analysing the reasons for the Irish No vote and will present its ideas at an EU summit in October.